With a population well over two million, Niigata Prefecture is located on Japan’s main Honshu Island facing the Sea of Japan. Niigata City is the capital and is the largest Japanese port on the Sea of Japan. The major industry of Niigata is Agriculture. With the exception of Hokkaido in the north, more rice is harvested in Niigata than anywhere else in all of Japan. Of special note is Koshihikari rice, which is harvested in Hakkaisan’s hometown of Uonuma, Niigata. Sold across Japan as the famous Uonuma Koshikari, this rice is the top exported brand from Niigata. In addition to rice, Niigata is also well known for tulips and watermelon. In regards to Japanese Sake, Niigata Prefecture is the third largest manufacturer with only Hyogo and Kyoto prefectures producing more. Niigata is surrounded with stunning natural beauty. There are 4 national parks and 2 semi-national parks. 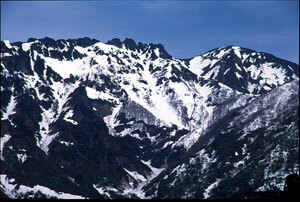 Hakkaisan mountain is the part of Echigo Sanzan Tadami semi-national park.